On a recent business trip to the UK, I met up with an good friend of mine, David Hughes, who introduced me to a fascinating concept that he had been discussing with a colleague of his, Darren Johnson. It’s a mirror image of the old concept – Let the Buyer Beware - Caveat Emptor which is a principle that says a buyer can’t recover damages from the seller except for concealed latent defects or for misrepresentation which amounts to fraud. One of the most basic principles in Lean is of Customer Value. Understanding what drives customer value; what customers are willing to pay for and then working to eliminate or reduce anything which takes away or blocks people from working to create value for customers is fundamental to Lean. 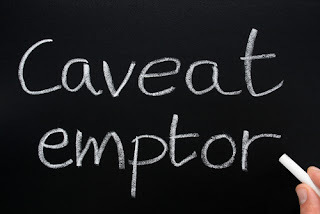 Caveat Emptor is an example of something which doesn’t create customer value. Customers value the ability to exchange goods or to have them repaired under warranty. In fact great Lean companies can turn a bad customer experience such as returning a defective product into a positive customer experience through the way and the manner in which they treat their customers. Have you ever gone into a store to return something expecting a fight only to be met by a courteous and friendly sales person who couldn’t do enough to ensure you were happy and created a very positive customer experience from a potentially bad one. That’s creating customer value. What can consumer do when a company doesn’t understand customer value and is a proponent of Caveat Emptor? The internet and social media has given consumers an outlet and a voice that can change the way business is being conducted. Imagine a restaurant with long wait times, sloppy service and cold food. Yelp, blogging and other social media apps crucify them. Posting poor reviews on-line is a sure way to not only make your feelings known but to impact the business as well. As they gain in popularity, social media reviews become even more powerful. Shame on the restaurant or business that ignores them. They ignore them at their own peril and they turn the table on Caveat Emptor. An example is Abercrombie & Fitch a well-known upscale clothing retailer. Some questionable marketing decisions have led to a massive social media campaign against them. Result - business is down and time will tell if they change their strategy although I believe in the world of “cool”, they are now a has been. In this age of social media and the internet, the tables have turned and it is truly a world of Caveat Venditor – Let the Seller Beware. Lesson – focus on understanding and delivering customer value.